Daily price is above Ichimoku cloud in the bullish area of the chart. 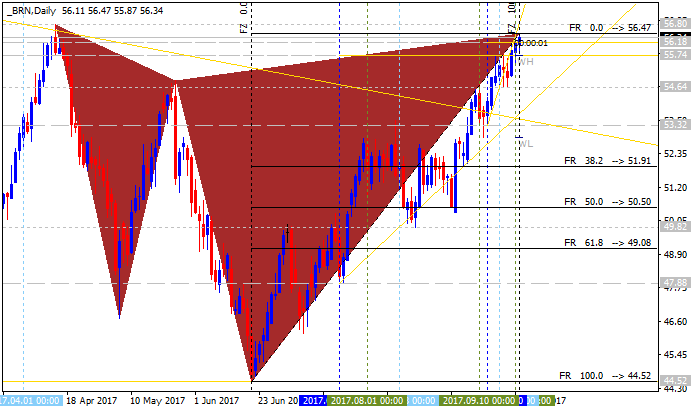 The price breaking symmetric triangle pattern together with 50.55 support level to below for the secondary correction to be started with 49.30 bearish reversal level as the nearest daily target in this case. "Are you confused why Oil is trading lower after an encouraging EIA Crude Oil Inventory Report that showed a draw of 5.39m barrels and had refiners processing 1m bpd more than last year’s record refining activity? In a word, or name, Harvey is why Oil is trading lower, and you can see the confusion through derivative markets such as time spreads of Oil and the Brent/ WTI spread." "Either way, the supply chain component of the energy market that was hurt by Harvey was refiners. What you need to know is that refiners were the demanding so much Oil from producers that the massive amount of production, the production that has thwarted OPEC’s best-laid plans to bring global stock pils back to the five-year average, and now that demand is stemmied. Even last week, as evidence was building that hurricane Harvey was going to be a force unlike Texas and refiners along the Gulf of Mexico had seen in a while, refiners were processing record amounts in order to put as much into inventory as possible for when they may be forced offline for prepares." Brent Crude Oil - "In short, Hurricane Harvey has transformed the global market for refined oil products. In addition to refining operations in the energy capital of the US (Houston, TX) remaining shut for an indefinite amount of time, there is an active port in Houston that takes Oil to the world (US exports have been a global dominating factor lately) that is inaccessible, and demand is uncertain. Some could argue the Broken Window Fallacy is good for demand. The theory argues demand is created from destruction, and thus Oil demand would benefit from the needed rebuilding. However, history tends to show that any gains are unevenly dispersed, and the economy as a whole is not better off with stronger demand than before." 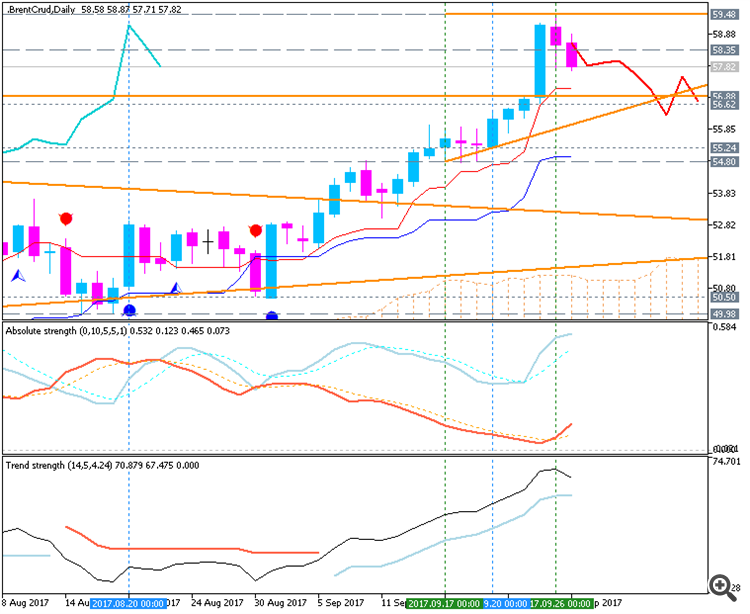 Price on the weekly chart is breaking 53.62 resistance on close W1 bar to be reversed to the primary bullish market condition with 56.62/58.35 resistance levels as the nearest bullish targets in this case for example. "Since last Tuesday, when data from the CFTC is collected, the price of crude oil has rebounded 8%. There remains a lot of confusion as to the future direction of crude oil given that the historical “boom/bust” cycle is being questioned due to the large increase in global supply from the hands of shell producers. Despite the concerns that Hurricane Harvey would leave the gasoline market as many refineries were flooded and temporarily put offline, there was little to no concern that there be a shortage of oil. Recent inventory data showed there is no shortage of crude, just difficulty in the delivery of refined products." 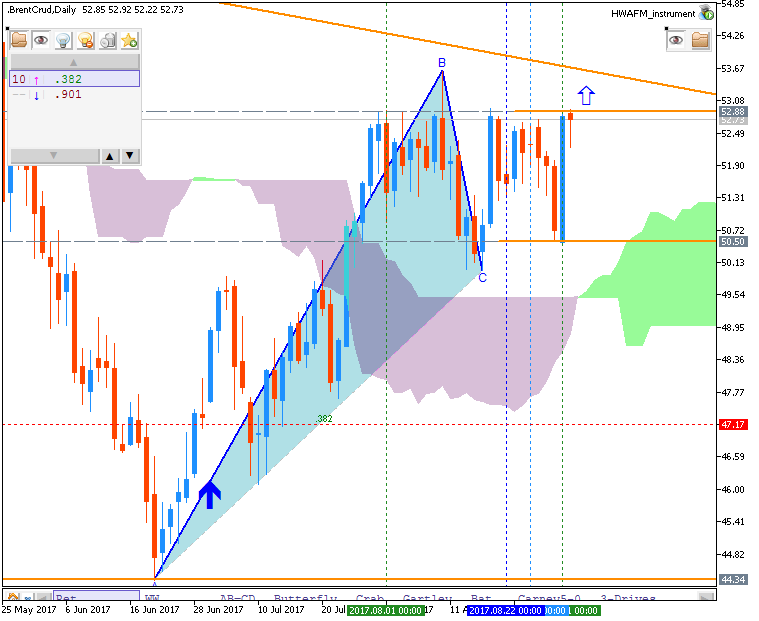 "Based on internal price action, I was keeping an eye on $48.15 per barrel, which was a terminating price of the triangle before the recent breakdown below $46 a barrel. As of last Thursday, we saw a sharp spike that led to the 8% rally with spoke about earlier as price cleared the internal resistance of $48.15 to trade as high as $49.39 on Wednesday. 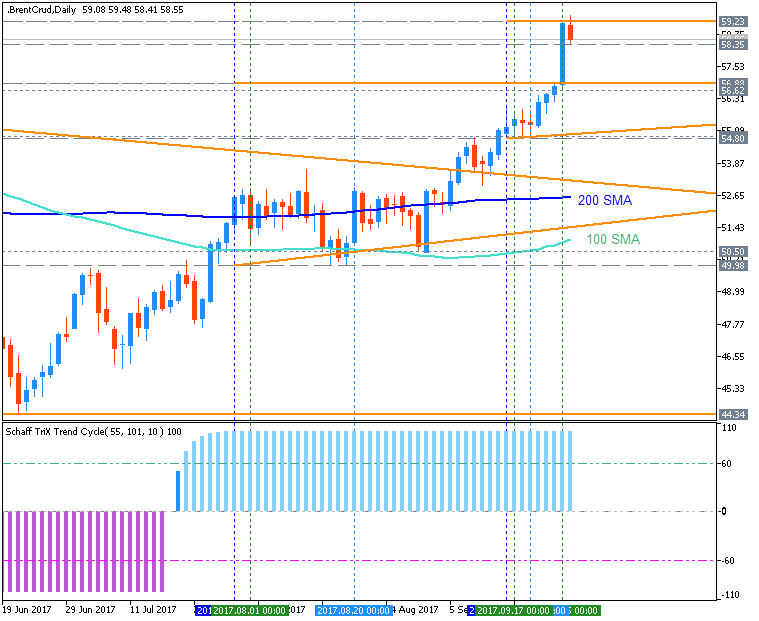 There is a confluence of resistance levels to watch between $49.67, which is the 200-day moving average, and the late July high of $50.20 per barrel. Between these two levels, there remains trendline resistance and Fibonacci levels that could resist a further price increase. One component that is helping the price of oil to remain supported is the weak US dollar." Daily price is located above Ichimoku cloud in th bullish area of the chart - the price is breaking 55.19 resistance level to above for the bullish trend to be continuing. "Energy prices have been battered for some time now. However, we could start to see a bounce in crude oil and gas prices due to the potential fall in supply, coupled with increased demand due to OPEC’s production cuts and Hurricanes Harvey and Irma. We’ve seen crude oil prices hovering below the $50, but this could change quite soon." "With crude oil and natural gas prices setting up for a potential rebound, there are some trading opportunities that have been uncovered, and some market participants might want to look to take advantage of some energy-related exchange-traded funds that have been pummeled." Crude Oil - "A key focus this week was the wide spread between the bullish-looking Brent Oil chart and the uncertain crude oil market. Mid-week, the spread between the global benchmark (Brent) and Crude Oil, identical products produced in different parts of the world was the widest in two years. As the gap closed, Brent traded higher and reached the highest price since April when it traded at $55.74 in the Bullish aftermath of the IEA report showing the global oil surplus was shrinking. The price support that traders should watch is not the 200-DMA at $49.56 that price is currently trading near, but the higher low of $47.08 from September 8. When looking at the chart above, you can see that the majority of price moves have been choppy and overlapping. This means that a break back below $47.08 would bring a continuation of the environment we’ve been trading in that is a multitude of three-wave moves that eventually move lower. Below $47.08 opens up the internal price support of $45.38, which has been a harbinger that Bearish Pressure was soon to reign supreme again." 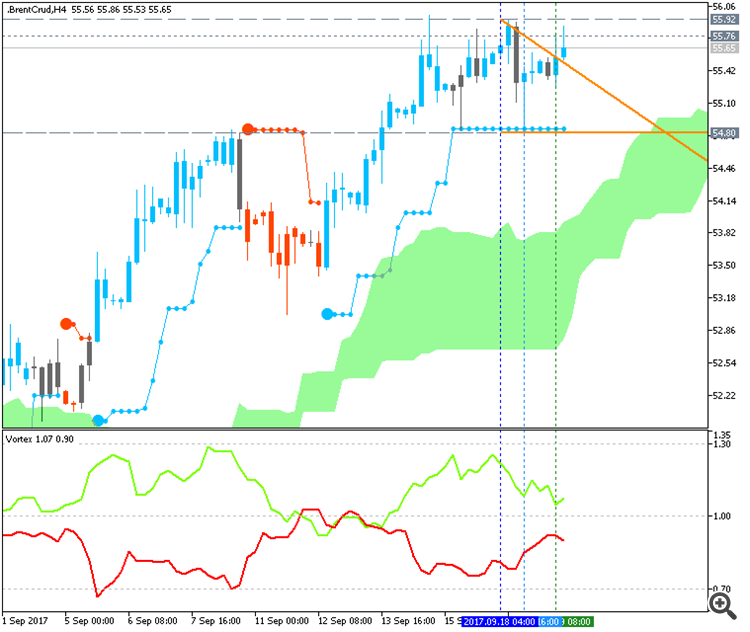 Intra-day H4 price is located above Ichimoku cloud in the primary bullish area of the chart. The price is testing 55.92 resistance level to above for the bullish trend to be continuing. Alternative, the descending triangle pattern was formed by the price to be crossed to below together with 54.80 support level for the secondary correction with the possible bearish reversal to be started. "The key level to watch here is the red upward sloping trend line. So long as prices remain above this trend line, then we can maintain a bullish bias. The red trend line runs near $48 today. If crude oil prices move below this red trend line, then it acts like a red warning signal on the dashboard. There are still bullish patterns available like a diagonal. However, the odds of other bearish patterns increases diluting the opportunity at a good risk to reward ratio. 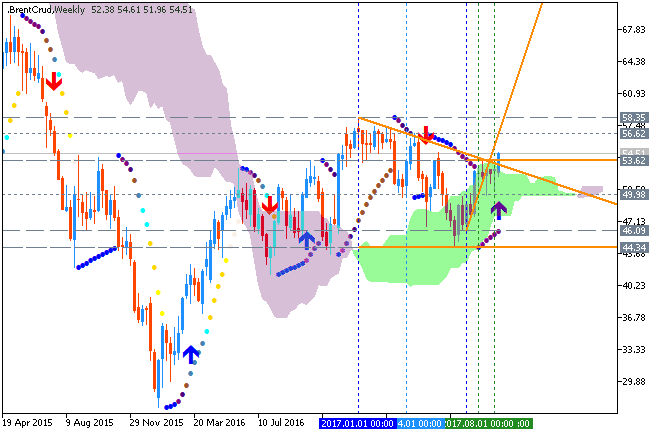 Bottom line, a break of the red trend line opens the door for a retest of the August 30 low at $45.57." "U.S. commercial crude oil inventories (excluding those in the Strategic Petroleum Reserve) increased by 4.6 million barrels from the previous week." 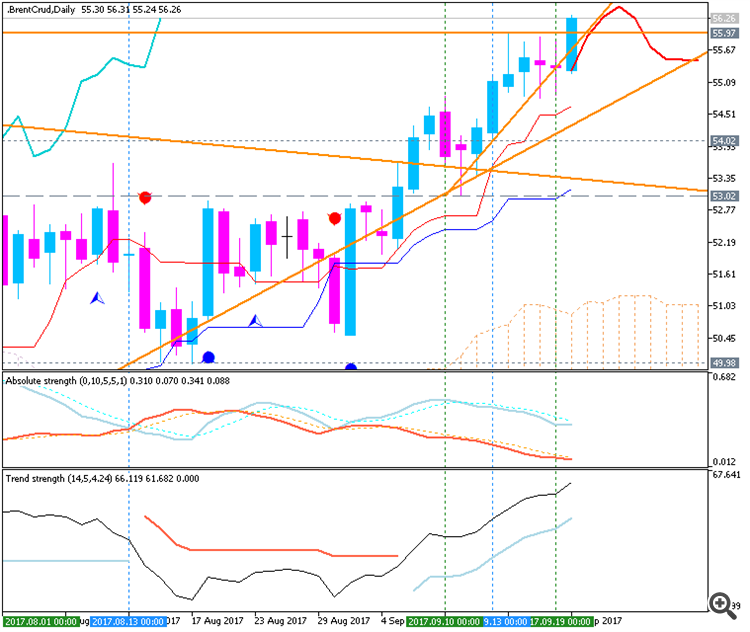 Crude Oil M5: ranging bullish. 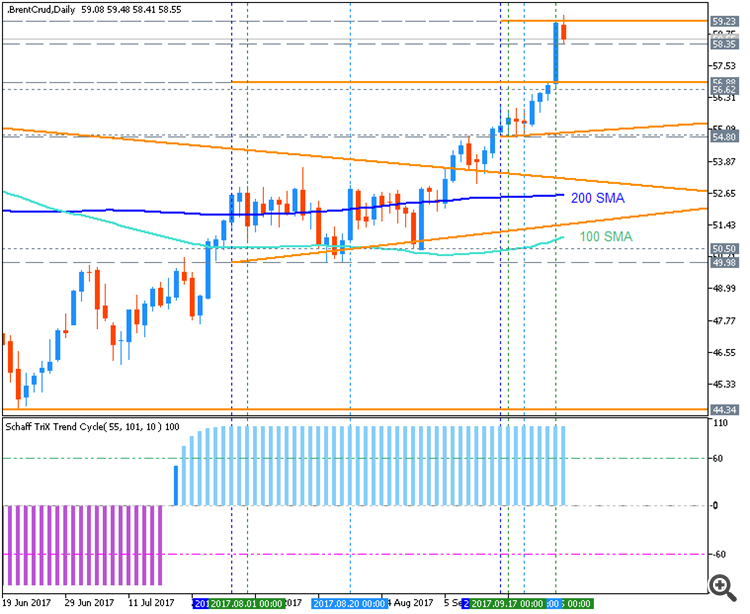 The price is located above 100 SMA/200 SMA reversal levels in the bullish area of the chart for the ranging within 56.31/55.61 support/resistance levels. 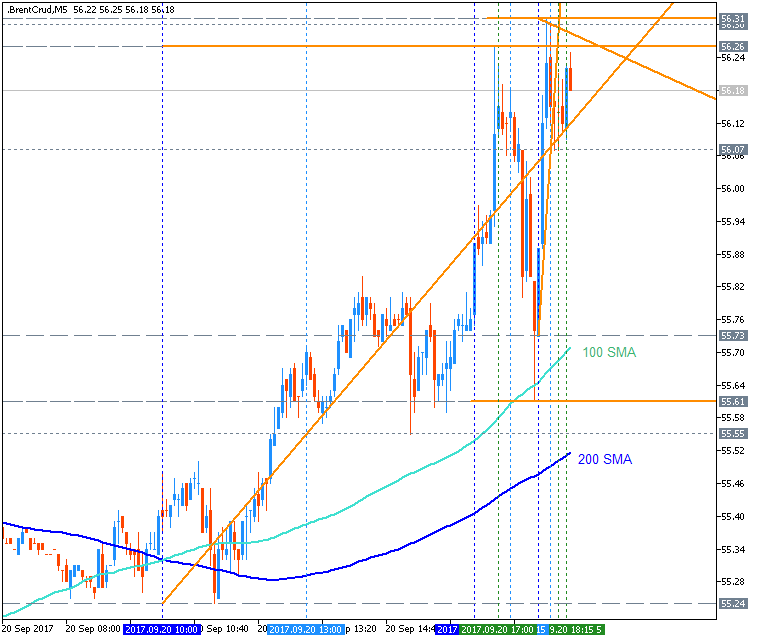 If the price breaks 56.31 resistance level to above on M5 close bar so the bullish trend will be continuing. 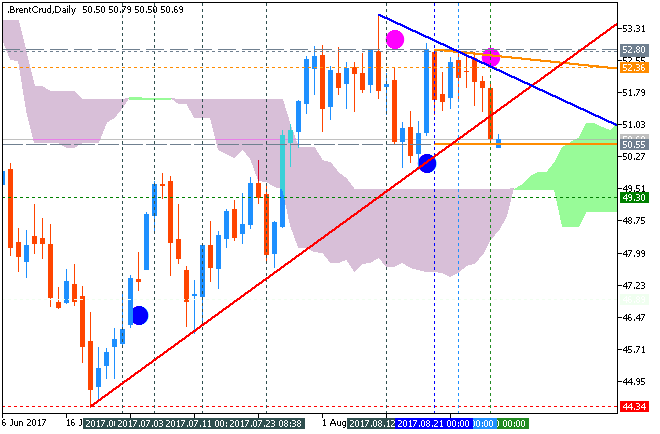 If the price breaks 55.61 support level to below on M5 close bar so the bearish reversal will be started. If not so the price will be on bullish ranging within the levels. Crude Oil Daily: bullish breakout. 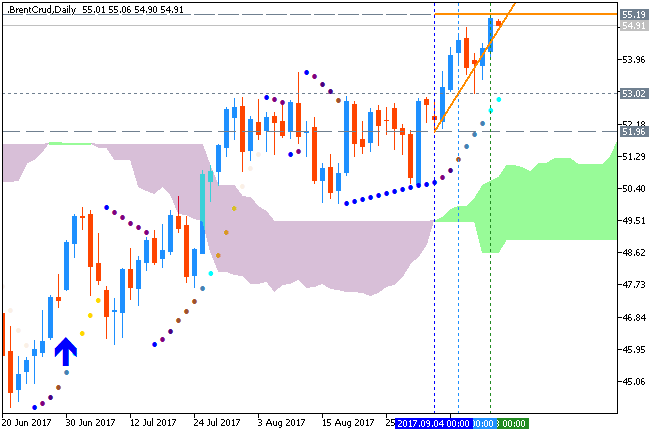 Daily price is far above Ichimoku cloud in the bullish area of the chart for 55.97 resistance level to be testing to above for the bullish breakout to be continuing with 56.62 nearest bullish target to re-enter. Crude Oil - "The price of a barrel of Brent crude, the global oil benchmark, hit a near 5-month high this week as the supply/demand imbalance continues to narrow but traders are now looking for additional action from OPEC when the current arrangement ends in March 2018. The latest release from the joint OPEC - Non OPEC Ministerial Monitoring Committee (JMMC) said that in August compliance with the production cuts hit a record 116%. And recent reports from both OPEC and the EIA showed that demand for oil continues to rise as global growth expands." 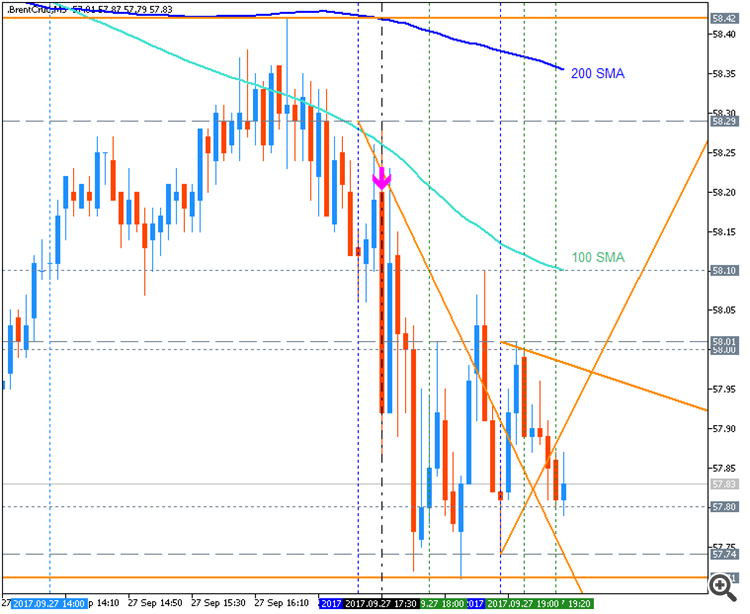 Chart was made on MT4 using iFibonacci indicator and MaksiGen_Range_Move indicator from CodeBase (free to download). Price on the daily chart broke 100 SMA/200 SMA reversal level to be reversed to the primary bullish market condition. The price is testing 59.23 resistance level to above for the primary bullish trend to be continuing. "Oil was up 3% today, hitting the highest levels since April. Remember, as we discussed a couple of weeks ago, if oil can sustain above the $50 level, watch for the inflation chatter to begin picking up. Why? Whether the Fed likes to admit it or not, oil prices play a big role in the inflation picture. This break has now led to about a 6% move in the price of oil, and we're now trading cleanly above the 200-day moving average (bullish)." "And there are a lot of fundamental tailwinds to keep oil moving much higher, not the least of which is an OPEC production cut into the persistent draw on supply over the past six months, AND an expected pop in demand into the end of the year (as expected by OPEC)." "U.S. commercial crude oil inventories (excluding those in the Strategic Petroleum Reserve) decreased by 1.8 million barrels from the previous week." 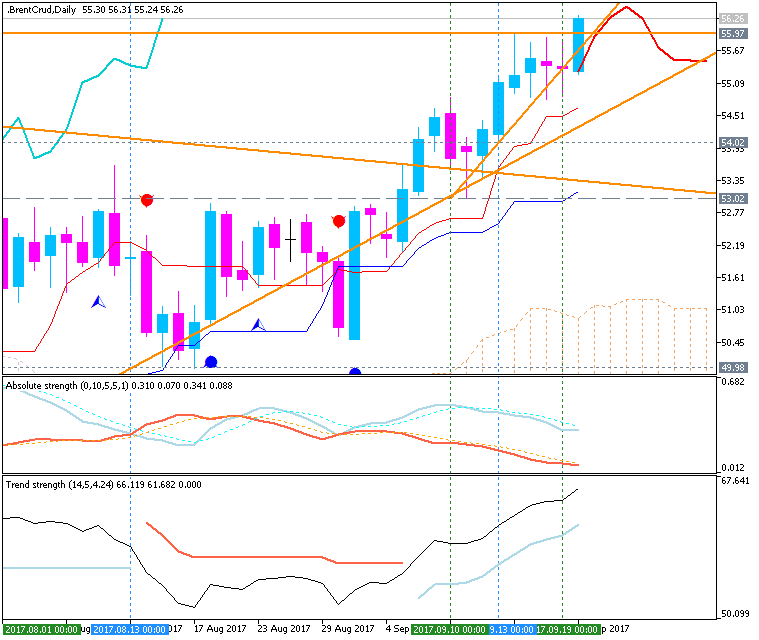 Crude Oil M5: ranging bearish. The price is located above 100 SMA/200 SMA reversal levels in the bullish area of the chart for the ranging within 56.31/55.61 support/resistance levels. 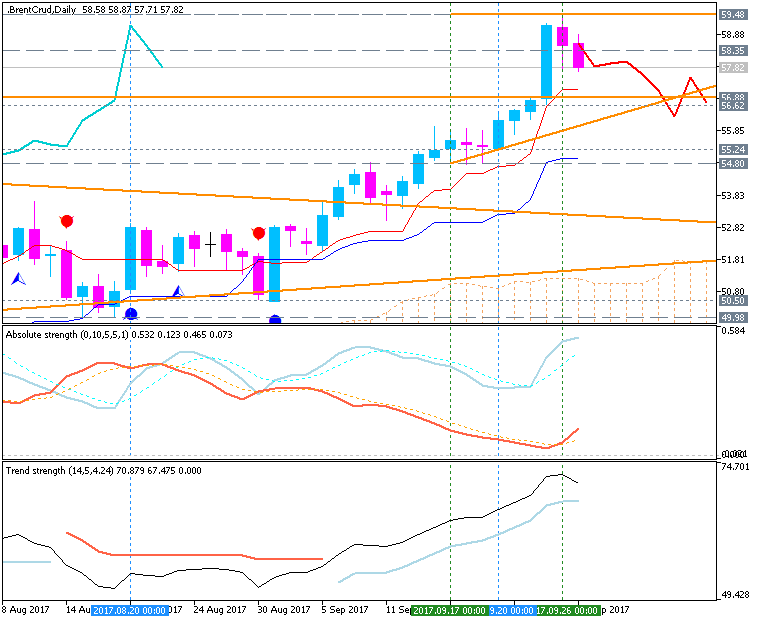 If the price breaks 58.01 resistance level to above on M5 close bar so the secondary rally within the primary bearish trend will be started. If the price breaks 57.71 support level to below on M5 close bar so the bearish reversal will be scontinuing. Crude Oil Daily: ranging bullish. 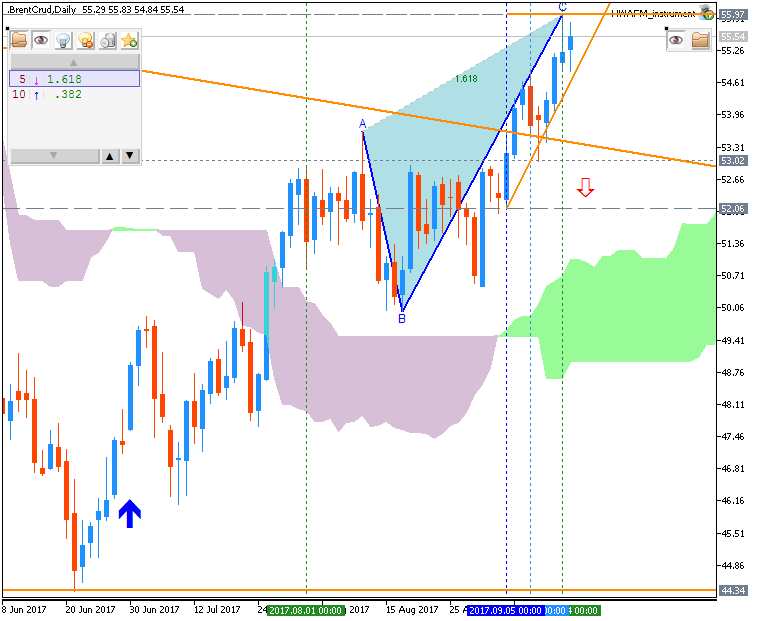 Daily price is far above Ichimoku cloud in the bullish area of the chart for 59.48 resistance level to be tested to above for the bullish trend to be continuing .